Wives of deer hunters can relate! 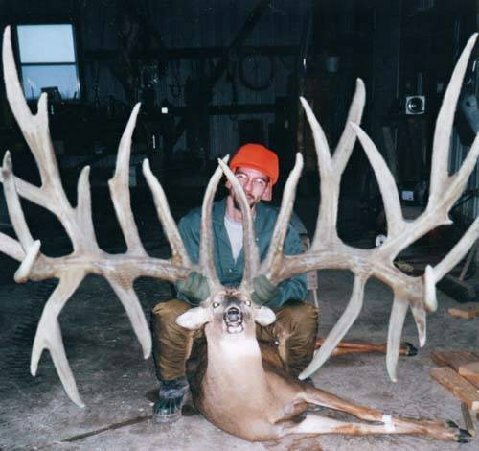 Here's a picture of the new world record whitetail. It was taken by the cousin of a co-worker's sister's, uncle's, best friend's, son-in-law's, niece's hairdresser's, neighbor's ex-boyfriend's oldest nephew. Reportedly it will score 2603-1/8 by B&C standard and was shot in West Texas on a really windy day, 85 degrees downhill, around a curve at 900 yards with a 22 mag. supposedly, this deer had killed a Brahma bull, two Land Rovers and six Jehovah's Witnesses in the last two weeks alone. They said it was winning a fight with Bigfoot when it was shot. It had also been confirmed that the buck had been seen drinking discharge water from a nuclear power plant. This has been checked on Snopes who confirmed it. Honest!!! I love how dorky the guy in the picture looks. If you are married to a deer hunter or any other kind of hunter I am sure you have gotten to hear the occasional (I'll just call it B.S.) story from someone about someone's cousin who shot the biggest, or the strangest looking deer. This one made me laugh out loud mocking all those stories. Bryan was the only one to get upset during the game. The boys doing what boys do. That's my Jackson at the bottom, Cole in the middle, and Lucas at the top. He just started doing these really cheesy smiles when I get the camera out. The 2 girls out of our crew. Thank goodness they are close in age and have such a good time together. They spent most of time riding 4 wheelers. I wish I would have gotten a pic of them on the 2 small 4 wheelers. Here they are on the big 4 wheeler. We let them drive it around a little bit.